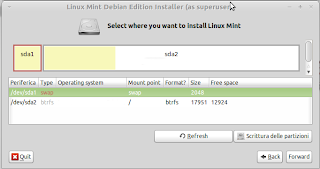 This post will guide you through the installation of LMDE on Btrfs filesystem. The goal is to have an high performing filesystem under you installation with the ability to take live snapshots of both your / and your /home folders in an independent way so you can rollback your system or data just by defining wich snapshot you want to use. Install LMDE normally and do NOT reboot at the end. wait till is done (5-10 minutes maybe). Now you can set a default subvolume to be mounted when the device is called for mounting, in our case will be root-sub (this makes GRUB able to access directly our root-sub without modifyng default grub options). We are now going to disable the fsck at boot because at time of writing is still under heavy development, so I think that can be risky to set it automatically at boot, and moreover there's a missing symbolic link that will stop boot process. And... yes, you're good to go: you can reboot and enjoy your Btrfs powered LMDE installation, now you have 2 different subvolumes for / and /home and you can take indipendent snapshots. Hi, I cannot create a sub volume. Why?? ?